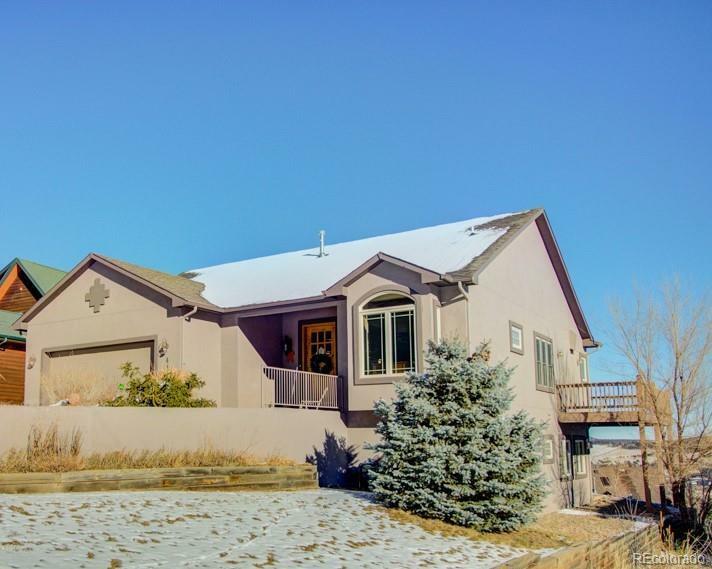 Luxurious Tuscan charm exudes in this sunny custom Palmer Lake rancher! Nestled below Baby Shoe Rock & above the Lake you will enjoy pristine mountain views from every window! Thoughtful design w/distinguished craftsmanship & finishes thru-out! True main-level living w/large master, laundry & office all on the main floor! Gleaming hardwoods, solid wood doors, custom trim & lighting! Gorgeous traditional kitchen w/hickory cabinets, granite counters & backsplash, Bosch dishwasher & Viking cooktop & vent fan! Living room made for gathering is anchored by a beautiful stone fireplace & large windows that bring the scenic setting inside! Semi-formal dining space for festive dinner parties! Master with large walk-in closet & en suite bath including double vanity & an elegant travertine & glass block shower! Enjoy morning coffee or lazy afternoons on the wrap around sun deck! Enormous family room w/energy-efficient Vermont Castings gas FP! Lower level patio w/newer hot tub!